We all know Mississippi produces some of the most highly regarded authors— from William Faulkner to Greg Iles. The authors mention in this post are recent additions to Mississippi’s collection of outstanding wordsmiths. Such books will make you proud of the South. Namely, they expose culture lost, changed, and maintained. Some will make you, if you’re from Mississippi, homesick; others will make you want to visit and see what Mississippi has to offer. Everyone in the quiet Jersey Shore town of Silver Bay knows the story: on a Sunday evening in September 1991, Ramsey Miller threw a blowout block party, then murdered his beautiful wife and three-year-old daughter. But everyone is wrong. The daughter got away. Now she is nearly eighteen and tired of living in secrecy. Under the name Melanie Denison, she has spent the last fifteen years in small-town West Virginia as part of the Witness Protection Program. She has never been allowed to travel, go to a school dance, or even have internet at home. Precautions must be taken at every turn, because Ramsey Miller was never caught and might still be looking for his daughter. Yet despite strict house rules, Melanie has entered into a relationship with a young teacher at the local high school and is now ten weeks pregnant. She doesn’t want her child to live in hiding as she has had to. Defying her guardians and taking matters into her own hands, Melanie returns to Silver Bay in hopes of doing what the authorities have failed to do: find her father before he finds her. Weaving in Ramsey’s story in the three days leading up to the brutal crime, Before He Finds Her is a stirring novel about love and faith and fear–and how the most important things can become terribly distorted when we cling to them too fiercely. Greg Iles continues the electrifying story begun in his smash New York Times bestseller Natchez Burning in this highly anticipated second installment of an epic trilogy of blood and race, family and justice, featuring Southern lawyer Penn Cage. Former prosecutor Penn Cage and his fiancée, reporter and publisher Caitlin Masters, have barely escaped with their lives after being attacked by wealthy businessman Brody Royal and his Double Eagles, a KKK sect with ties to some of Mississippi’s most powerful men. But the real danger has only begun as FBI Special Agent John Kaiser warns Penn that Brody wasn’t the true leader of the Double Eagles. The puppeteer who actually controls the terrorist group is a man far more fearsome: the chief of the state police’s Criminal Investigations Bureau, Forrest Knox. The only way Penn can save his father, Dr. Tom Cage—who is fleeing a murder charge as well as corrupt cops bent on killing him—is either to make a devil’s bargain with Knox or destroy him. While Penn desperately pursues both options, Caitlin uncovers the real story behind a series of unsolved civil rights murders that may hold the key to the Double Eagles’ downfall. The trail leads her deep into the past, into the black backwaters of the Mississippi River, to a secret killing ground used by slave owners and the Klan for over two hundred years . . . a place of terrifying evil known only as “the bone tree.”The Bone Tree is an explosive, action-packed thriller full of twisting intrigue and deadly secrets, a tale that explores the conflicts and casualties that result when the darkest truths of American history come to light. It puts us inside the skin of a noble man who has always fought for justice—now finally pushed beyond his limits. Just how far will Penn Cage, the hero we thought we knew, go to protect those he loves? In a matter of days Samantha moves from Manhattan to Brady, Virginia, population 2,200, in the heart of Appalachia, a part of the world she has only read about. Mattie Wyatt, lifelong Brady resident and head of the town’s legal aid clinic, is there to teach her how to “help real people with real problems.” For the first time in her career, Samantha prepares a lawsuit, sees the inside of an actual courtroom, gets scolded by a judge, and receives threats from locals who aren’t so thrilled to have a big-city lawyer in town. And she learns that Brady, like most small towns, harbors some big secrets. Her new job takes Samantha into the murky and dangerous world of coal mining, where laws are often broken, rules are ignored, regulations are flouted, communities are divided, and the land itself is under attack from Big Coal. Violence is always just around the corner, and within weeks Samantha finds herself engulfed in litigation that turns deadly. 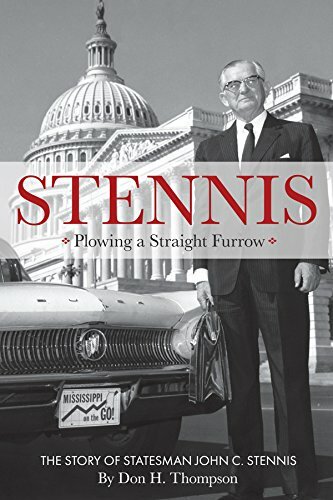 Upon the death of Theodore Bilbo in 1947, John Cornelius Stennis won a special election to fill Bilbo s U.S. Senate vacancy. In 1952, he won the general election and served in the senate for 41 years. Much of our state’s progress is due to Stennis devotion to those who struggled to make a living he dedicated his entire working life to helping others. Despite his allegiance to Mississippians, his vision also encompassed both the nation and the world. Among his colleagues, Stennis was known as Mr. Integrity. He wrote the first Senate ethics code and cautioned unilateral entrance into the Vietnam Conflict. Stennis was also labeled the Father of America s modern navy. The supercarrier USS John C. Stennis was named in his honor. Stennis wanted his state and country to prosper and he believed in government of, by, and for the people. Dr. Donald Zacharias, President Emeritus of Mississippi State University, said of Stennis, We see qualities in your life that we want in our own lives. Life is better for each of us for what you have done. Photographer and architect Nell Dickerson began her exploration of antebellum homesteads with encouragement from her cousin-in-law renowned Civil War historian and novelist Shelby Foote. Her passion for forgotten and neglected buildings became a plea for preservation. Gone is a unique pairing of modern photographs and historical novella. Foote offers a heartbreaking look at one man s loss as Union troops burn his home in the last days of the Civil War. Dickerson shares fascinating and haunting photographs, shining a poignant light on the buildings which survived Sherman’s burning rampage across the Confederacy, only to fall victim to neglect, apathy and poverty. GONE is a powerfully moving volume that will change how you see the forgotten buildings that hide in obscurity across the Southern landscape. From the photographer: The Civil War had been over for exactly ninety years in 1954, when my cousin, Shelby Foote, published–PILLAR OF FIRE–as part of his novel, Jordan County: A Landscape in Narrative. The book’s stories painted a vivid picture of a fictitious Mississippi county steeped in Southern culture. PILLAR OF FIRE took readers into a heartbreaking and commonplace scene late in the Civil War, when Union troops moved through the civilian South destroying not only plantations but also ordinary homes and cabins. Those troops, battle-hardened and bitter from the loss of their own brethren, shared the tragic effects of war. In PILLAR OF FIRE, they take no joy in burning a home in front of its dying, elderly owner and his frail servants. The cruelty of the circumstances is as much a given for them as the dying man’s grief over all the memories that burn with his house. Now, on the eve of the Civil War’s 150th commemoration, my mission is to draw attention not only to the architectural heritage devastated by the war but also the heritage we’ve lost since then: to neglect, to poverty, and to shame, as the war’s infamy colored the attitudes of later generations and tainted the homes those generations inherited. What the war didn’t take, time and apathy did. And yet those grand old homes whether mansion or cabin deserve our reverence and protection. #1 New York Times bestselling author Greg Iles returns with his most eagerly anticipated novel yet—Natchez Burning—the first installment in an epic trilogy that interweaves crimes, lies, and secrets past and present in a mesmerizing thriller featuring Southern lawyer and former prosecutor Penn Cage growing up in the rural Southern hamlet of Natchez, Mississippi, Penn Cage learned everything he knows about honor and duty from his father, Tom Cage. But now the beloved family doctor is accused of murdering Viola Turner, the beautiful nurse with whom he worked in the early 1960s. A fighter who has always stood for justice, Penn is determined to save his father.The quest for answers sends Penn deep into the past—into the heart of a conspiracy of greed and murder involving the Double Eagles, a vicious KKK crew headed by one of the wealthiest and most powerful men in the state. Now Penn must follow a bloody trail that stretches back forty years, to one undeniable fact: no one—black or white, young or old, brave or not—is ever truly safe.